Water: you’ll find it everywhere on Planet Earth. It’s in us, and around us, in constant motion. It evaporates from the surface of oceans, lakes, and rivers, rising into the sky to become water vapor. Chilled, water vapor condenses, forming clouds—giant masses of water droplets. Pushed by the wind, clouds move vast distances. Eventually, rain falls from the clouds, soaking back into the land and rejoining the oceans, lakes, and rivers. 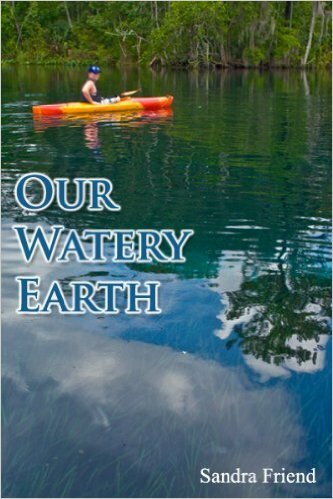 Our Watery Earth follows the life cycle of water and how it shapes the landscapes – and waterscapes – around us. Originally written for the Exploring Planet Earth series in 2002, the book was returned to me, unpublished, when Twenty First Century Books was acquired by Lerner Books. Once technology made it possible, I produced a Kindle edition from the manuscript in 2011. Kindle edition. 42 pages, black and white.